I am expecting a tornado and severe weather outbreak to occur tomorrow in what I would call the heart of Tornado Alley. However, that’s a worthless statement from any perspective—forecasting, meteorological, geographical—without a qualification of the term “Tornado Alley.” I have long thought that the true “heart” of Tornado Alley is not over Oklahoma City at all, but is instead farther east. In truth, where that heart is depends on what one chooses to look at. 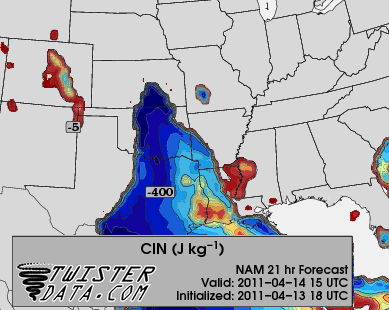 (For long-tracked violent tornadoes, the bull’s eye is, beyond a shadow of a doubt, over Mississippi.) Some meteorologists developed the idea of three distinct tornado alleys: Plains Alley, the traditional storm-chasing zone in the Plains states that is often referred to with the general appellative of “Tornado Alley”; Dixie Alley, a broad region encompassing much of the Southeast but not including parts of Texas that are climatologically and geologically more similar to Plains Alley; and Hoosier Alley, which is essentially the Midwest. However, if you really take a good look at it, I think you’ll find that the entire eastern region of the country between the two mountain ranges is Tornado Alley. There is no distinct border where you can say, “There are not nearly as many tornadoes in this small region as there are in either ‘Alley’ on each side of it,” and in the absence of such a thing, the only reasonable thing to do is to say it’s all one Alley. (Besides, “Hoosier Alley”? Really?) With the whole of the U.S. between the mountain ranges as Tornado Alley, it seems reasonable to expect the core somewhere east of Oklahoma City, and the meteorological data bear this fact out. 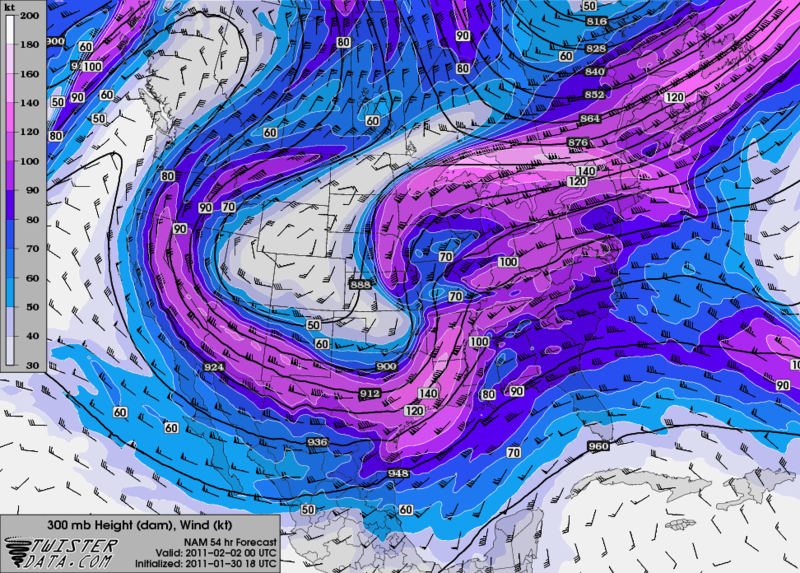 Now that that’s out of the way, let’s take a look at the science behind this and see why there will be severe weather, as well as where it should occur. 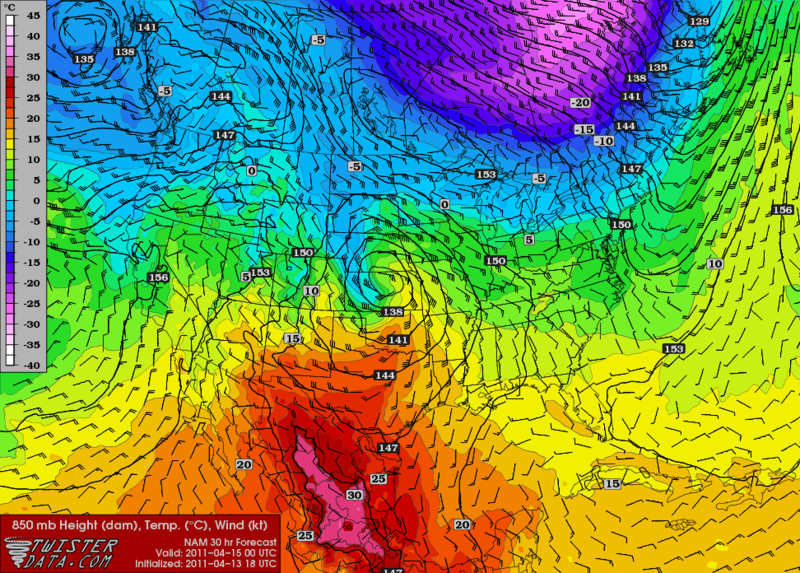 The weather-maker will be a low pressure center forming east of the Rocky Mountains. 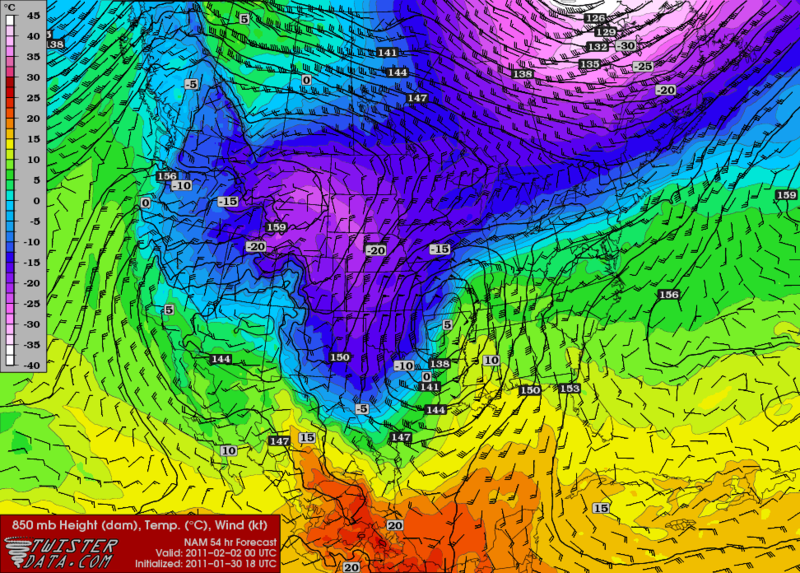 A low that is currently analyzed at 1009 mb (which is to say, not much of a low) is located over Kansas right now. 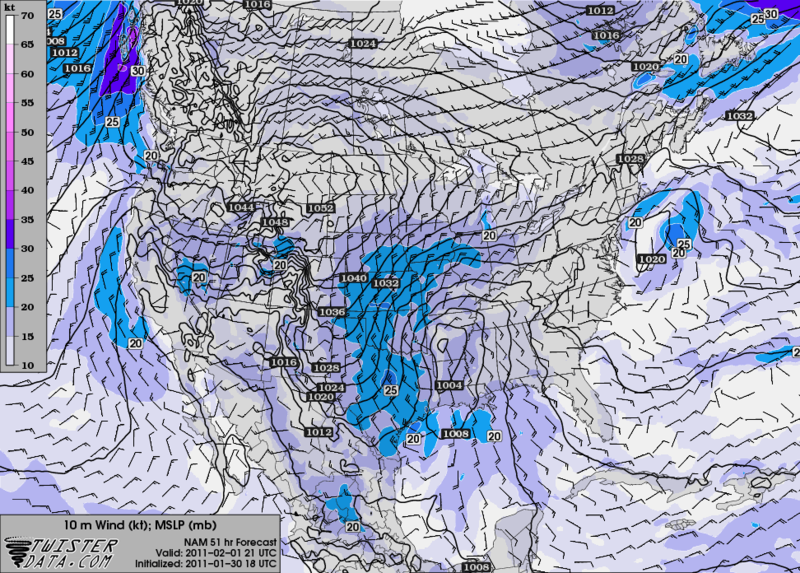 This cyclone is forecast by the NAM to open up as it weakens and become more of a broad trough. This should be occurring right now, in fact. After that low dies out, a strong upper-level low (700 mb) is set to close off its circulation over the TX/OK panhandles on Thursday. 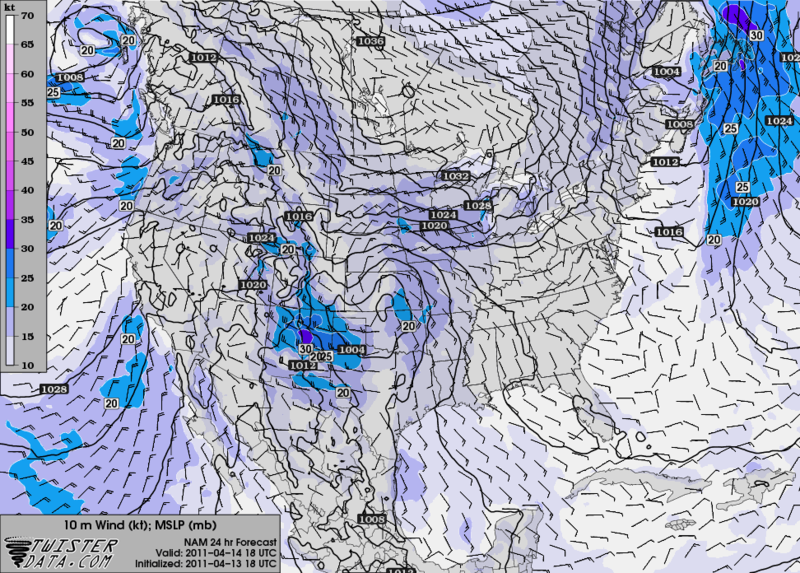 Upper-level cyclogenesis should have occurred by 9:00 to 10:00 tomorrow morning (CDT). The usual vertical tilt of these kinds of cyclones will result in the surface low being over central Oklahoma at this time, and it should be at about 1000 mb by midday tomorrow. Thermal advections will be strong, with the greatest warm-air advection (WAA) occurring in an area just west of Tulsa, OK to north TX to the AR/LA border. 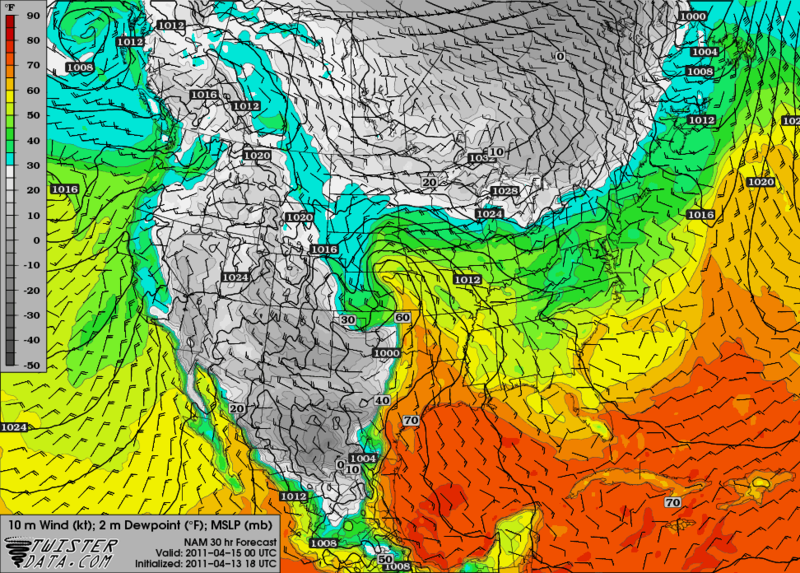 Temperature advection drops off in northeast Arkansas. Surface dewpoint temperatures will be quite high, approaching 65-70 from Tulsa south along the OK/AR border in a narrow swath. A larger area of 60-65 F dewpoints will cover the area from Oklahoma City through a diagonal line bisecting Arkansas NW-SE. However, despite all this moisture around the surface, a dry socket should be present at the critical 700 mb level in the atmosphere. 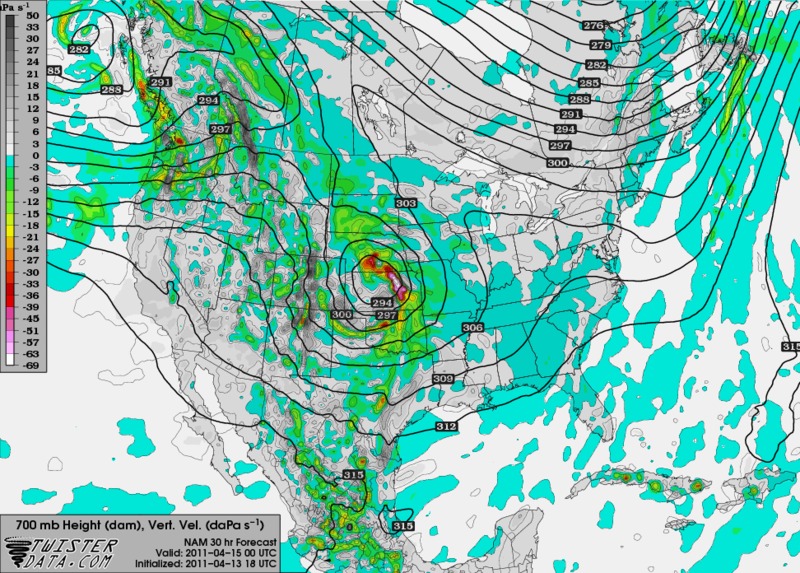 This shows up on a synoptic model forecast map as a medium brownish-gray blotch of low relative humidity. 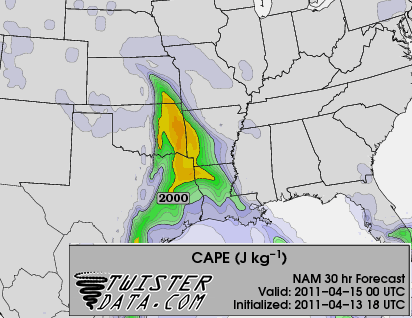 All this will lead to mixed-layer CAPE values approaching 2500 J/kg. The instability will definitely be present, and between the thermal advection and the diffluence-based forcing from the low, lift should be present over the target area. 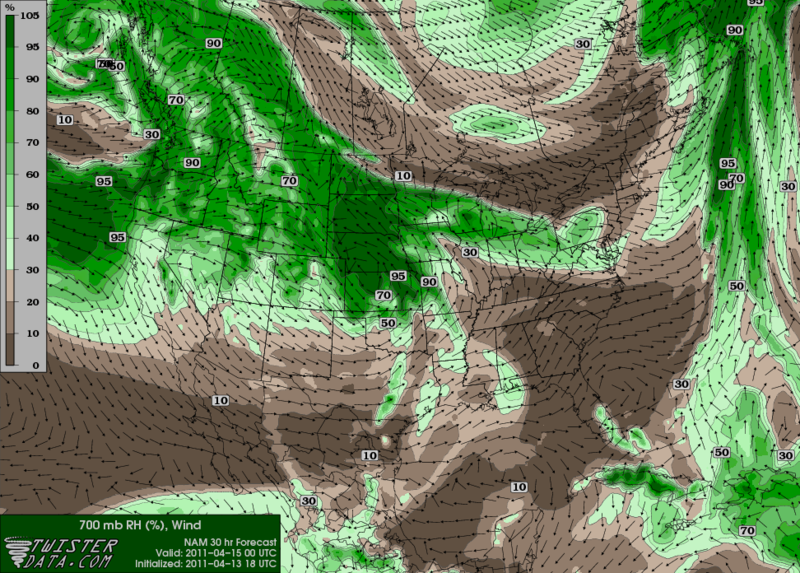 Decent upward vertical velocities are forecast by the models to be present over the area of interest. 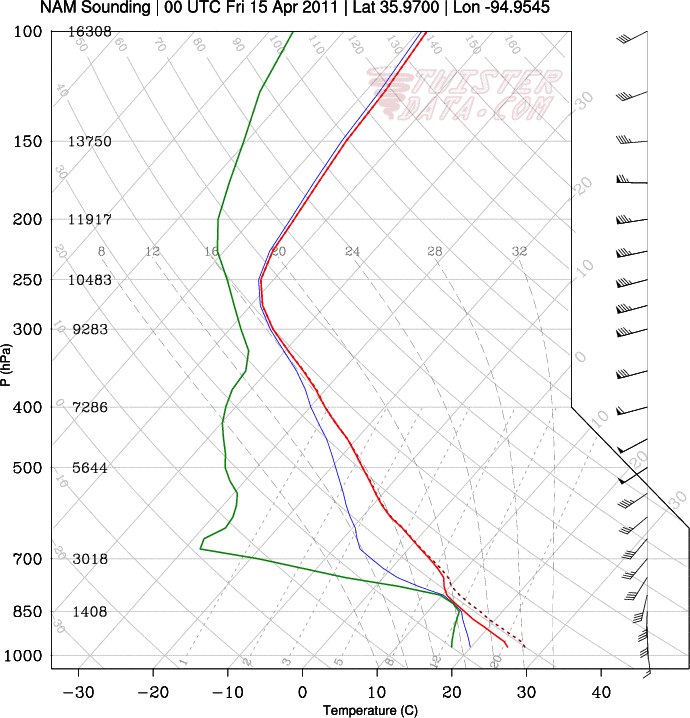 A cap of CIN will be in place early in the day, but as the surface heats up, the surface temperature should remove the temperature inversion, making it easier for moist parcels of air to rise. The disappearance of the capping inversion also shows up in forecast soundings for the area bounded by Tulsa, Fort Smith, and Fayetteville. They indicate that a substantial warm surface layer will have developed by late afternoon, and with CAPE values as high as they are expected to be, this will set off convective growth. Helicity values are also supposed to be quite high, with 0-3 km at 300-500 over the target area, at a time coinciding with the high CAPE values and the eroded cap, which will support supercellular development instead of linear. This increases the risk of tornadoes and large hail. The Storm Prediction Center has already put up a Moderate risk for this general area, which I agree with 100%. I wouldn’t be overly surprised to see them go with a High by tomorrow morning, though this is a small enough area that they may not do it on the basis of its size. In any case, I am growing quite confident of a risk of supercells tomorrow for eastern Oklahoma, western Arkansas, and southwest Missouri. If I were to pick one city that I think has the highest chance of a significant impact, I’d go with Tulsa. However, a slight shift in any direction of the low’s movement would result in a shifting of the severe weather risk, and these events are never points, but areas. It is looking like a potentially dangerous day tomorrow for this region of the country, so people living there should make sure they keep aware of what is going on in the afternoon and be ready to act.